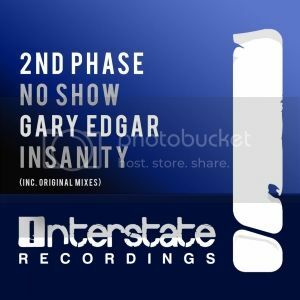 2nd Phase & Gary Edgar - No Show E.P [Interstate] | OUT NOW! Thread: 2nd Phase & Gary Edgar - No Show E.P [Interstate] | OUT NOW! Next up on Interstate, we've got two tech trance behemoths that are guaranteed to tickle your tech trance bone. 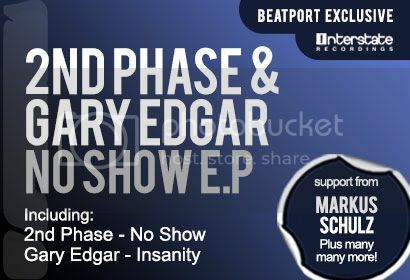 Featuring rising stars 2nd Phase and hotshot Gary Edgar, together forming the ‘No Show E.P’. First up, the 2nd Phase boys, who need little introduction, deliver the epic ‘No Show’. In true 2nd Phase style, it’s a driving, tech workout with its infectious groove, dirty bass and moody hook. Watch out for the poignant breakdown, as they carefully execute a masterful break and epic drop. Turning up the wick on the flip, Gary Edgar brings up the rear with ‘Insanity’. Continuing in much of the same vein, it’s another tech infused concept that delivers on every level. Dirty grooves, a killer hook and guaranteed to cause carnage when dropped. Huge!